There’s a lot of talk in alternative healing circles about aligning the body’s energy with cosmic healing frequencies. Whether methods currently promoted to this end work, or whether such methods are scientifically sound, is beyond the scope of this article. 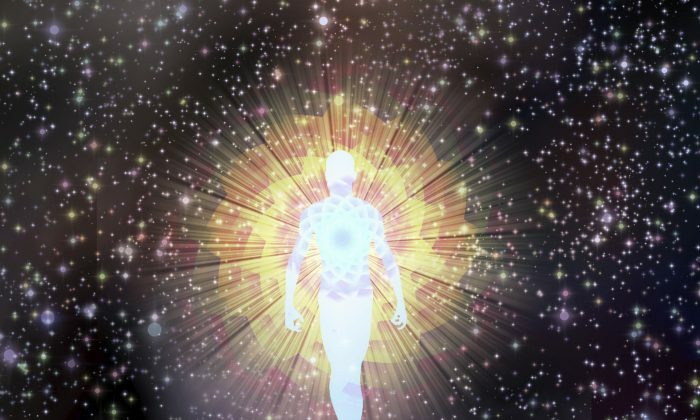 But, a study presented by researchers in May at the Society for Scientific Exploration conference in Washington, D.C., does suggest that our bodies are attuned to frequencies in the cosmic environment. York Dobyns, who received his doctorate in physics from Princeton University and worked at the Princeton Engineering Anomalies Laboratory for 30 years, is a co-author of the study and he presented it at the conference. Rollin McCraty, Ph.D., at the Institute of HeartMath was the lead author. He and his team found that environmental variables, such as cosmic rays, solar activity, and electromagnetic waves in the Earth’s atmosphere, may account for about 2–8 percent of heart rate variability. The study involved 16 participants in Saudi Arabia. Their heart rate variability was tested from March 1 to Aug. 31, 2012. Data was simultaneously collected on 12 variables of the geomagnetic or cosmic environment. Factors, such as circadian influences, were accounted for when analyzing the data. The majority of the 120 tests (74 of the tests) showed a p < 0.05 significance. This means it is less than 5 percent likely that the heart rate variability was due to chance rather than the influence of the cosmic environmental factors Dobyns was testing; in other words, it is more than 95 percent likely the cosmic environmental factors had an influence on their heart rate variability in these 74 tests. Furthermore, 26 percent of the tests showed a p < 0.001 significance; it is more than 99.9 percent likely in these tests that the cosmic environmental factors had an influence on heart rate variability in these tests. It is more than 95 percent likely the cosmic environmental factors had an influence on their heart rate variability. Schumann resonances and cosmic ray counts were among the factors shown to significantly influence heart rate, according to Dobyns. Music is so much more than just entertainment – it is an ancient and sacred form of medicine with wonderful side-effects, head-to-toe, body and soul.